Originally published under the title, "'Top Secret' Turkey." In 2013, Turkey hosted about a dozen conferences on cyber security and new technologies to counter cyber threats. 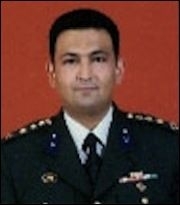 In a speech at the end of the year, Colonel Cengiz Özteke, commander of the military General Staff's division for electronic systems and cyber defense, said that the Turkish military now considered cyber security as the country's "fifth force" [after land, air, sea, and apparently space]. The colonel could not know that slightly over a year later, Turkey would become a joke when the words cyber and security come together. One of the drivers testified that the cargo had been loaded onto the trucks from a foreign airplane at Ankara's Esenboga Airport and that, "We carried similar loads several times before." Half a year later, a military prosecutor took charge of the legal proceedings and concluded that, "this incident was a military affair." Then came a total media blackout on it. Finally, all law enforcement officers, including the Gendarmerie units, who searched the trucks, were put on trial on charges of "international espionage." The recording detailed Erdogan's Syria policy, in which "an attack on Syria 'must be seen as an opportunity for us [Turkey].'" In the conversation, the spymaster is heard saying that a false flag operation would be very easy and that he could "send a few men to Syria to attack Turkey [to fabricate a cause for war]." Also in the conversation, Fidan is heard saying that "he had successfully sent two thousands trucks into Syria before." Davutoglu's office had to admit the authenticity of the recording but claimed it was "partially manipulated" and was a "wretched attack on Turkey's national security." The perpetrators were never found. 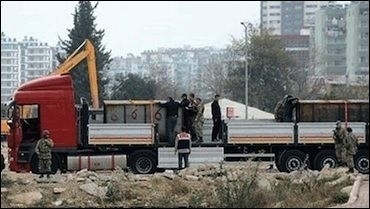 More recently, Turkish media reported that a shadowy group, which calls itself the Syrian Electronic Army (SEA), had leaked secret and confidential material it had obtained by hacking the email communications of top strategic Turkish government agencies, including the President's and Prime Minister's offices, the Foreign and Defense Ministries, and the Air Force Command, from March 2009 to November 2012. Mehmet Askar, who is now on trial at a criminal court in Turkey along with 11 other suspected IS fighters, unveiled that a 2011 plan for the transfer of arms to two jihadist groups, the Islamic State and Jabhat al-Nusra, as well as to the more moderate Free Syrian Army, was hampered by the capture of a key border town by the Syrian army. All three groups have been fighting the regime Syrian President Bashar al-Assad, Erdogan's regional nemesis and obsession. Askar's accomplice, Haisam Toubalijeh who was involved in a weapons transfer from Turkey to various jihadist groups, and thwarted in 2013 by Turkish forces, reassured him that contacts inside the Turkish state would help facilitate the movement of the weapons, which included some 100 NATO rifles, across the border. Turkey's "affairs and dealings" with the jihadist groups, involving arms and ammunition, are now as public as its country profile on Wikipedia. They are also as public as Turkey's political support for Hamas, considered a terrorist organization by most of the international community, as well as for Hamas's parent organization, the Muslim Brotherhood, yet another terrorist organization, this time for the Egyptian government. Recently, an Egyptian court in Alexandria met on February 24 for the first hearing to consider a lawsuit demanding that Turkey be designated as a "state that supports terrorism," according to Turkey's semi-official news agency, Anadolu. Tarek Mahmoud, an Egyptian lawyer who filed the lawsuit at the court, claims that President Erdogan had supported the Muslim Brotherhood movement after the ouster of Egypt's Islamist President, Mohamed Morsi, who was Erdogan's devoted ally. Guess what comes up on the Turkish agenda when "top secret Turkey" is no longer top secret? Turkish authorities, on February 17, hosted a meeting that brought together Turkish and other cyber security experts.